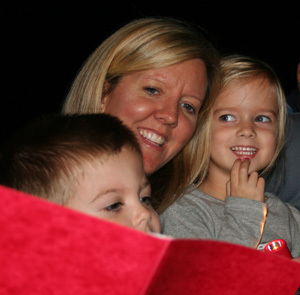 Shannon, Porter & Abby Best enjoy the caroling hayride. The beauty of the lights and the joy of everyone in the neighborhood coming together to share a little holiday spirit is one of the things that makes Wells Branch so special. It was exciting to see all the different groups working together for the community and the magic of the season in the adults as well as the children. All had a glow about them. While lighting the luminaries on Saturday, our almost four-year-old granddaughter came upon Santa, quite to her surprise. He burst through an open window and shouted, “Ho, Ho, Ho. Have you been a good little girl?” This encounter left her speechless for a good half hour. When she saw her siblings later, she shouted (breathlessly), “He’s here! The REAL Santa – I saw him!! !” Since I had the privilege of going on all but one of the trips through the neighborhood, I feel like I got to spend time with everyone who came out and each trip was a DELIGHT. Not a cross word was spoken; the spirit of goodwill, friendship and joy was ever present. This is what it’s all about! We live in a great community thanks to all of you (not just those listed above). Celebrate it every chance you get! ***If I’ve left anyone off, please know that it was unintentional and contact me at the link below so that I can remedy the situation. See “Community” for photos of Luminary Fest.